Here are a few suggestions to get you started with planning activities for your winter party. Some of the activities are better suited to larger groups, but be creative and see what works for a party your size. If you’ve got a bigger group and you decide to split them into teams, you could give them some warning and encourage them to organize a team name, costumes, or props for the event. Have a backyard rink? Invite people to bring their skates for a twirl on the ice or a game of hockey. Milk jug curling is great for all ages, too. Build snowmen and snow creatures. Fill spray bottles with coloured water and let your party artists loose on the snowy white canvas. Bottles that squirt rather than spray work the best – try empty ketchup and mustard bottles. Book your community league rink and fire pit. Set up an obstacle course, scavenger hunt or broomball game. Or find a popular neighbourhood spot and hold Hot Chocolate Socials! Residents of Oliver Community League arranged to have a fire pit at a popular corner every two weeks in winter. They provided hot chocolate and a few chairs, and witty conversation. Neighbours reconnected and others met for the first time. It was a great way to get to know each other. Take advantage of what the City parks have to offer. Go skating, tobogganing, snowshoeing, or cross-country skiing. Or explore the river valley trails in winter – you’ll be surprised how different things look covered in snow! Take part in Edmonton’s unique Front Yards in Bloom: Winterscapes program! Make your wintry front yard beautiful and whimsical by creating snow sculptures, adding ornaments to your trees, or building snow creatures. If you want a bigger canvas, go to your community hall and create something for the neighbourhood. Community groups and school classes can take part, too! Ideas, photos of past entries, and contest information are available on the Winterscapes website. Winter is a great time to sit by a fire. You can use a portable fire pit in your backyard, or many community leagues have permanent fire pits outside their halls. Grab a shovel, clear the snow out of the pit, and join your friends around a nice warm fire. Roast some wieners, bake chocolate-cake-filled oranges, roast marshmallows, or make s’mores. You can even keep a pot of hot chocolate going on the fire to warm your party-goers. Remember that seat cushions and blankets are a good idea for helping to keep your partiers warm. If your party site doesn’t have seating, encourage people to take folding chairs or cushions to sit on. Divide your group into two teams, hand out some old-fashioned corn brooms and a ball, set up two goals, and voilà!, you’ve got a broomball game. There are usually five players and a goalie on each team, but adjust this as you need to. The team with the highest number of goals wins. This game is traditionally played on a hockey rink with a goalie and five players on each team, but you can play quite easily on the snow. If you choose to play on the ice, helmets are a good idea for all players. A cross-country ski party could be a good way to introduce family and friends to this popular winter activity. Several sports shops also offer cross-country ski equipment rentals. Why not have a party at one of the local ski hills? Contact the hill ahead of time to see what they can offer your group. If you have family or friends who have never skied before, the Edmonton ski hills are a great place to learn. Have you explored Edmonton’s great trails in the winter? They look very different than they do in the summer. Pack a snack or lunch, meet up with family and friends, and take a hike! If you have a rink for your party, you could have a game of shinny hockey. Many community leagues have hockey nets and sticks; ask if you can use them when you rent the hall. Find a popular spot in your neighbourhood and hold Hot Chocolate Socials! Residents of Oliver Community League arranged to have a fire pit at a popular corner every two weeks in winter. They provided hot chocolate and a few chairs, and witty conversation. Neighbours reconnected and others met for the first time. It was a great way for neighbours to get to know each other. Kicksleds are very popular for getting around in many northern countries. Ask your CRC about borrowing City-owned kicksleds for your party. You could just let everyone try them out, or you could organize relay races; in other words, play! If you have access to your community hall rink, why not try curling? A few days before your party, freeze water in 2L or 4L plastic milk jugs – you’ll need four per team. Only fill the jugs about half way so they don’t get too heavy for kids to use. You can also colour-code the jugs for two teams by adding food colouring to the water. If you can mark rings on the ice with coloured water – or washable markers! – great. If not, place a pylon or marker at one end of the rink. Players take turns trying to get their jugs the closest to the marker. The team with the closest jug wins. Make your own monster or dinosaur tracks with homemade cardboard snowshoes. Cut out crazy shapes that are larger than your boots, poke small holes into the cardboard beside your boots, thread string through, and tie them on. Head down to the park and create some monstrous tracks. Set up an obstacle course so your party-goers can try out several winter activities. If your group is big enough, form teams and have a friendly competition. Patios aren’t just for summer! Did you know that if you can find a spot that’s sheltered from the wind and in full afternoon sun, it can feel 15°C warmer than the air temperature? That means if it’s -10°C, it can feel like +5°C on your patio. No more excuses! On a beautiful sunny winter day, set up a table and chairs, and put out seat cushions and blankets, serve warm drinks, and catch some rays. Many community leagues have skates that they lend out for use on their rink. If you’re renting the hall, ask about using the league’s skates and equipment. Remember that helmets are recommended for children and everyone who’s learning to skate. 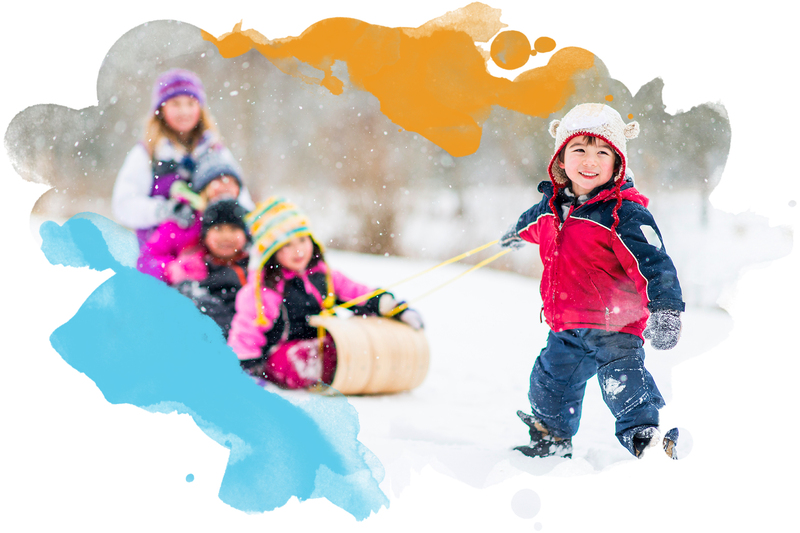 Fill some spray bottles with coloured water and let your party artists loose on the white snow canvas. Bottles that squirt rather than spray work the best – try empty ketchup and mustard bottles. Discourage ‘water battles’ as participants will become cold very quickly! All you need is a field, snow tubes, sleds or toboggans, some rope to pull with, a few teams, and you’re set for the races! Set up a route in the snow. Be creative; it doesn’t have to be a straight line. Have one team member sit on the sled and have one or two others pull. This activity can take place in a field or on a toboggan hill. However, if you’re at a toboggan hill, be aware of non-party-goers who are also there. It would be a good idea to keep your group off to one side to avoid getting in the way of other tobogganers. What’s better than a friendly snowball fight?! If the snow isn’t sticky enough, or if your organization doesn’t allow for actual snowballs to be thrown, consider using rolled up socks instead. Ask your party-goers to bring a pair of socks or two to donate to your local shelter. Roll the socks up, starting at the toe. When you get to the end, flip one side of the top over the whole thing, and you’ve got a great sock ball. The socks will probably get wet, so you’ll have to wash them before delivering them to the shelter. If you’ve got sticky snow, build snowmen! Or snow creatures. Or the Ogopogo. Let your imagination run wild. You could even use coloured water in spray bottles to add some colourful touches. If you’re hosting the party in your backyard, you could build a snowslide or snowfort beforehand. Check your local library for great books on how to build snowforts. If the party is being held at your community league, check to see if they will let you build a snowslide or snowfort on their property. Liability? 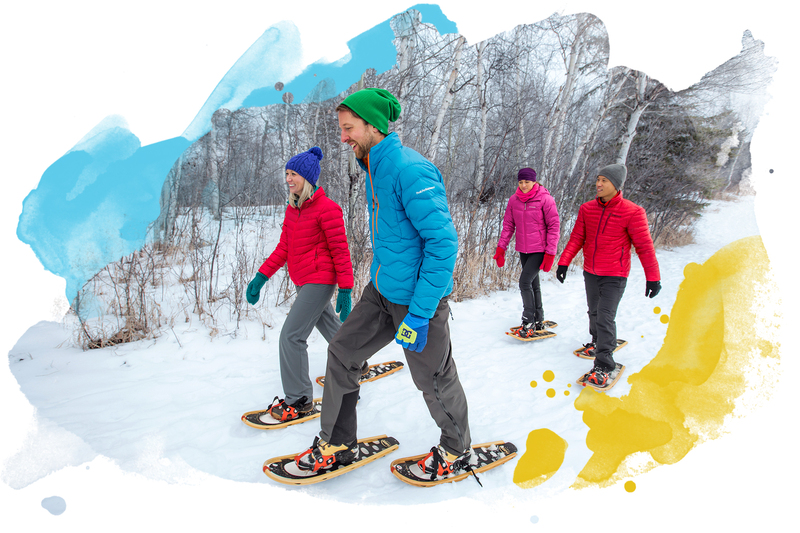 Ask your CRC about City-owned snowshoes. Having some at your party would be a great way to introduce family and friends to this growing sport. You could even set up an obstacle course or hold a relay race. And why not snowshoe soccer? All you need is teams, snowshoes and a ball. Sparklers are great fun at night. Try writing with them or drawing pictures in the air as someone takes a photo. See if you can capture works of sparkly art. Have your party at a toboggan hill. The City-maintained toboggan areas offer different slopes for different folks – gentle, moderate and steep. These hills have safe run-outs, safety signs and reduced hazards. Remember to follow all posted signs and safety rules, and consider wearing a helmet. The City posts conditions and notifications about the toboggan hills on its website, so check www.edmonton.ca/toboggan before you head out. Winter is a great time to observe wildlife, especially in the ravines and river valley. Tracks are visible in the snow, and bird calls travel easily through the crisp winter air. Watch for signs of our winter wildlife on and off the trails. What kinds of tracks can you find? Which birds are singing in the trees? Look at the trees and shrubs, too. Can you find signs of animals eating berries, twigs and bark? Host your very own Winter Olympic Games. You could organize your party-goers into country teams and even hold an opening ceremony at the beginning and a medals ceremony at the end. Choose your winter sport activities, create team score cards, and assign judges to the sport stations. Tally the results at the end and hand out medals to the winning teams. Medals can be as simple as chocolate coins on strings. Talk to your NRC about equipment that might be available for you to use. Choose one or two winter-only sports and host a tournament. Check with your CRC to find out what kind of winter sports equipment may be available. Take part in Edmonton’s unique program called Front Yards in Bloom: Winterscapes! Invite family and friends over to make your wintry yard beautiful and whimsical by creating snow sculptures, adding ornaments to your trees, or building snow creatures. If you want a bigger canvas, go to your community hall and create something for the neighbourhood. Community groups and school classes can enter the contest, too! Ideas, photos of past entries, and contest details are all available on the Winterscapes web page.